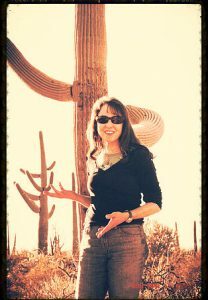 Lynn is a native (since age 5) of Tucson, Arizona where she continues to befriend the saguaros and wildlife. Since she grew up in this beautiful desert city, a thread of Southwest flavor shows up in many of her humorous stories for children. Lynn Rogalsky was made aware of her writing talent by a middle school English teacher. In high school during her senior year, Lynn’s English teacher also praised her writing abilities. She encouraged Lynn to study Journalism, which she did at Pima Community College and the University of Arizona. Lynn began her professional writing career as a newsroom intern at KGUN Ch. 9, Tucson’s ABC-affiliate TV station. She quickly worked her way up to News/Feature Writer and 10PM News Producer, giving her B.A. in Journalism a good workout. Currently, Lynn works as a freelance Slogan Writer, which takes a lot of creativity to project an idea in one short phrase. She also loves writing quirky picture book manuscripts. In the past, Lynn has enjoyed working as a Copywriter for a catalog company and ad agency. With a minor in Creative Writing, it was only natural that years later, she would yearn for more than news and feature stories. Lynn fell in love with the idea of writing for children at a free workshop given by award-winning children’s author, Jennifer Ward in 2008. That spark took flame after meeting another Tucson children’s author at the Pima Writers’ Workshop. As an active member of the Society of Children Book Writer’s & Illustrators (SCBWI) since 2008, Lynn has been inspired by many authors and fellow members. In Spring 2009, she completed the class “Writing For Children” at Pima College, taught by award-winning children’s book author, Juanita Havill. Lynn has since written several picture book manuscripts , one chapter book, and has a middle grade novel in the works. Lynn is actively submitting manuscripts to agents and editors. Being a member of a dynamic SCBWI writer’s critique group is a biweekly highlight. Photography is another passion of Lynn’s. Visit her photography fan page, Through Lynn’s Lens on Facebook.